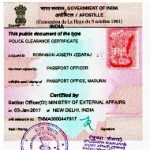 There are 2 steps for Apostille and 3 Steps for Embassy Attestation for Chennai issued Birth Certificate. India is a member of the HCCH (Hague Convention) of October 5, 1961, abolishing the requirement of Apostille legalization of foreign public certificates. Chennai issued Birth certificate apostille is acceptable in approx 107 member-countries of the HCCH. Apostille is done for personal documents such as Birth Certificate and Birth Affidavits.